Cooking school in Italy, in luxury villas Casa Ombuto, Torre del Tartufo in Tuscany. The Italian cooking vacation is run by Paola Baccetti in Casa Ombuto and Franco Palandra in Torre del Tartufo and the Italian Mediterranean cooking vacations are run by Laura Guisti. 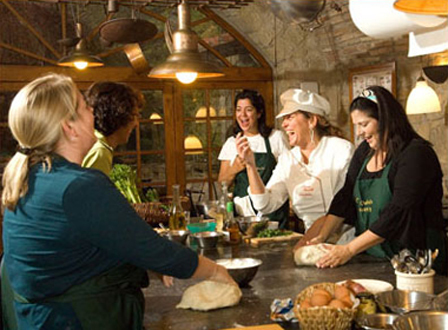 Tuscookany has been giving cooking holidays in our Italian cooking school in Tuscany for over 10 years. The lessons are given in English and for the Italian cooking class you will learn to make classic Tuscan dishes and for the Italian Mediterranean cookery course you learn to make dishes from four of the most popular cuisines in Europe and North Africa. The classes are given in the cantinas which haven been especially equipped as professional kitchens with enough working space of everyone to get rolling and chopping! Casa Ombuto and Torre del Tartufo are both luxurious villas with large large heated pools and are both set on extensive estates in the Tuscan hills with spectacular views of the surrounding hills and valleys. Elected by the Newspaper as one of the Top ten cookery schools in Europe.